Kerr’s recognition keeps growing. Picture: Justin Lloyd. IT'S almost expected, it's getting repetitive, but Sam Kerr's continuing haul of awards in 2018 is absolutely deserved. Kerr was the only Australian to leave this year's ESPYs with an award in hand, winning the Best International Soccer Player at the ceremony held at the Microsoft Theater in Los Angeles. Only two other Aussies were nominated for awards. NBA basketballer Ben Simmons was beaten by Utah Jazz's Donovan Mitchell for Best Breakthrough Athlete and Stephanie Gilmore lost out to snowboarder Chloe Kim for Best Female Action Sports Athlete. Kim also won Best Female Athlete. The ESPY winners were voted on by fans after nominees were selected by the ESPY Select Nominating Committee. For Kerr, she now has to find room for another trophy after a spectacular year that has resulted her rocketing to international stardom. After exploding onto the world scene at last year's Tournament of Nations, Kerr was a goal scoring machine in the National Women's Soccer League in the US last season. She has been awarded back to back Julie Dolan Medals as the best player in the W-League (this year a joint winner with Clare Polkinghorne). She was named Asian Women's Footballer of the Year and now has lucrative offers to play around the world. 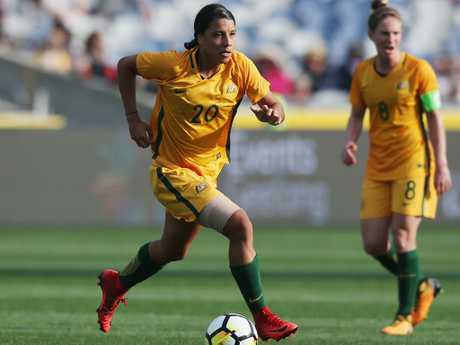 Football Federation Australia are currently working on a deal to keep Kerr in Australia next summer after learning of offers from big European clubs who are trying to secure her services. It was a big night for women at the ESPYs. The event was hosted for the first time by a female, racer Danica Patrick doing an outstanding job. 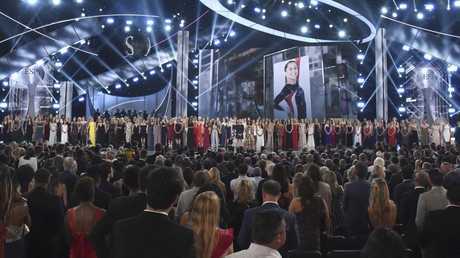 Everyone was brought to their feet at the end of the ceremony when hundreds of women took to the stage to collect the Arthur Ashe Award for Courage. The women were honoured for speaking out against the former doctor of the US National Gymnastics team, Larry Nassar, who was found guilty of sexually assaulting hundreds of girls and women during decades in the job.